I went in for one thing. One. Thing. Some plastic baggies for my kid’s Valentine’s for school. That’s all I needed. But, alas…Michael’s is evil. So terribly, wonderfully EVIL. Out I came with a bag loaded down with rafia ribbon, chocolate melts and candy molds. I’m weak-minded. It’s true. I’m a marketing and merchandising gold mine. I see things that look fun and suddenly think I’m crafty & I buy them. I suppose I should consider myself (and my bank account) lucky that I didn’t find some uber involved super-craft project to throw myself into. One time, I went into Michael’s with my cousin and came out with about $150 worth of blank canvases, paints, brushes and what-not. I was absolutely sure I’d be the next Picasso with all that crap. I remembered very quickly that I haven’t an artistic bone in my body once I started trying to actually use it. This time wasn’t that bad I guess. 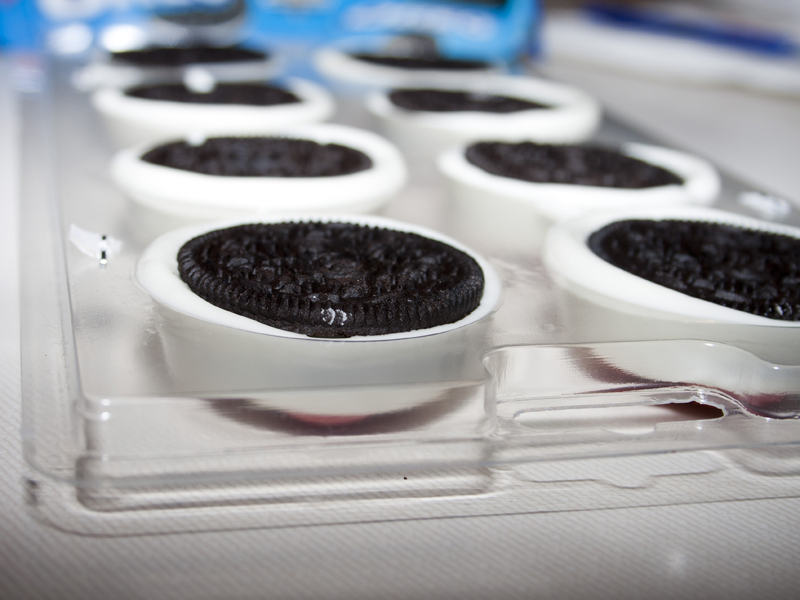 You still have time to brave a trip to Michael’s yourself and pick up the tools needed to make these delicious dunked Oreos. 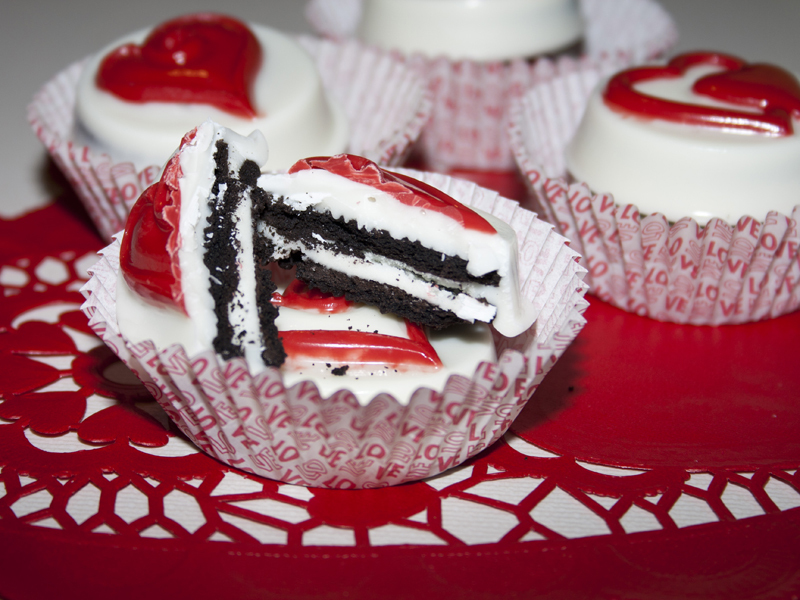 They are quite easy, a fun project to do with the kids for Valentine’s Day, and make plain old Oreos absolutely gorgeous. Just two simple ingredients. 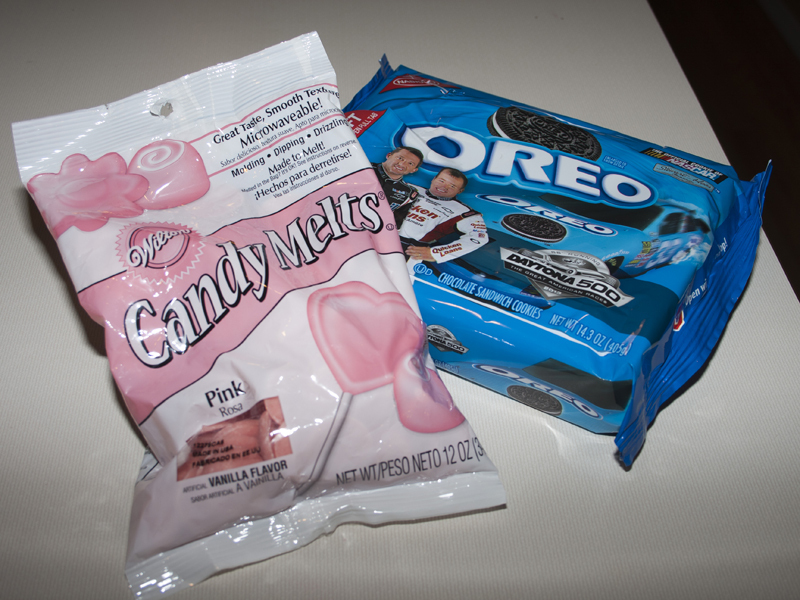 Oreos and candy melts. 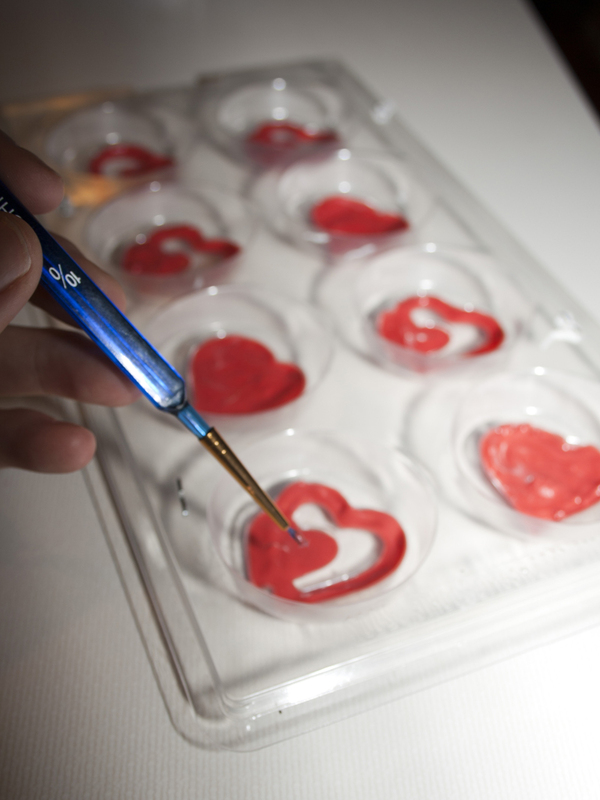 If you want to do the two-tone, melt one color melts and “paint” the color onto the molds. Allow it to set up before pouring the solid color on top. Fill the candy molds 2/3 of the way with your main color. I melted the candy melts in a Ziploc bag and snipped the corner for ease. 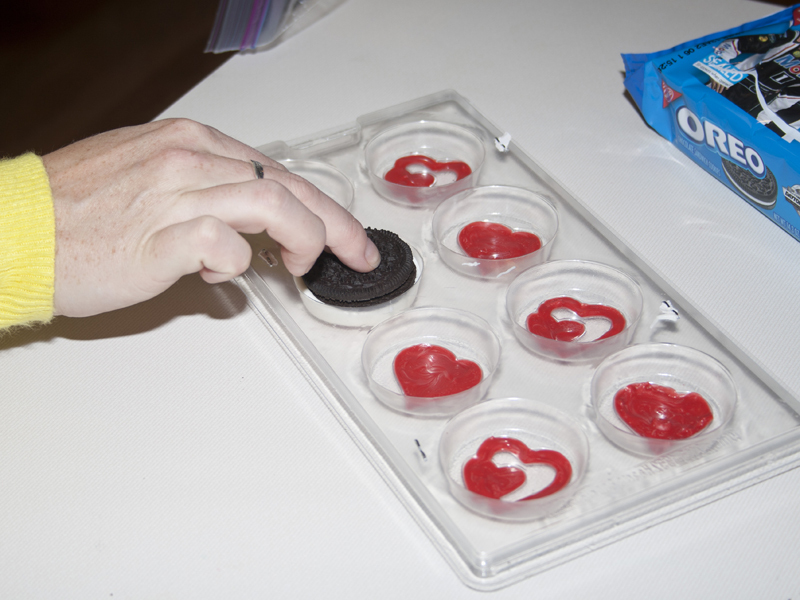 Then, press an Oreo into the well until it is flush with the top of the candy mold. 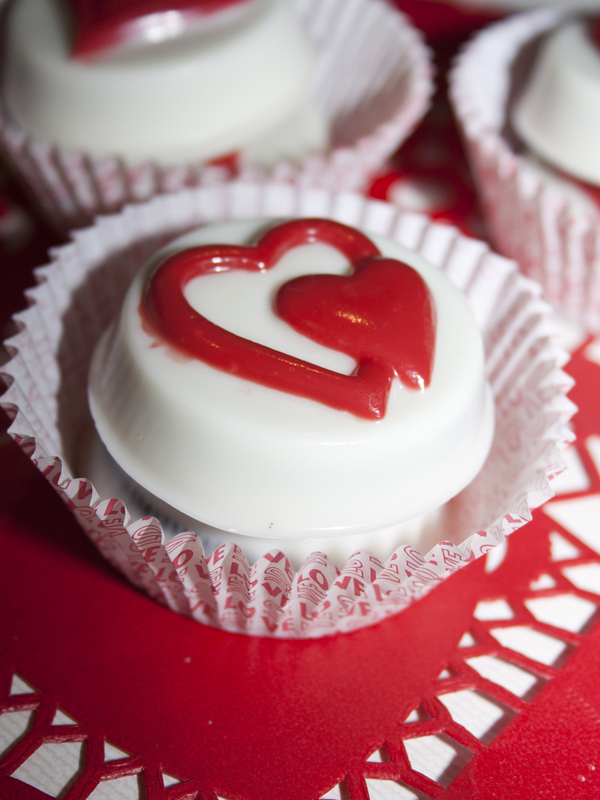 Pop them into the fridge until firm. Then, turn the mold upside down and twist slightly to release. 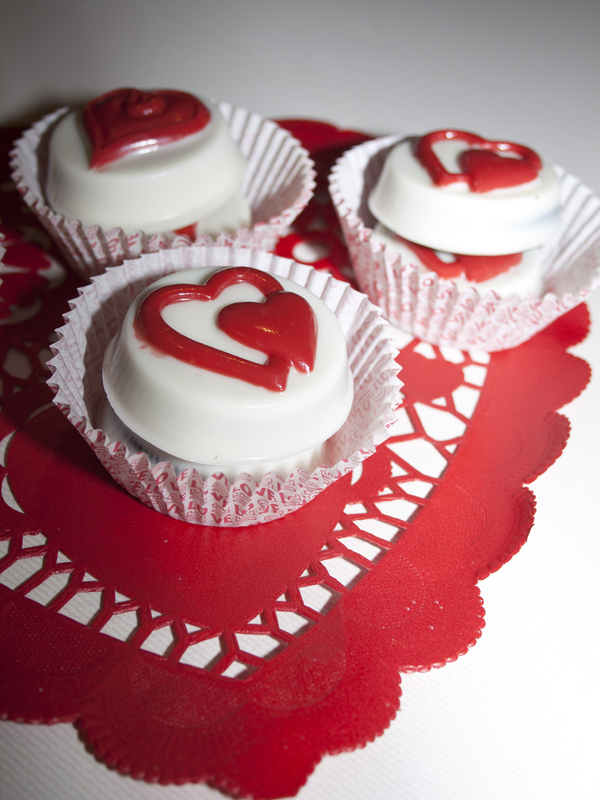 Perfect for a little treat to deliver to the neighbors on Valentine’s Day! 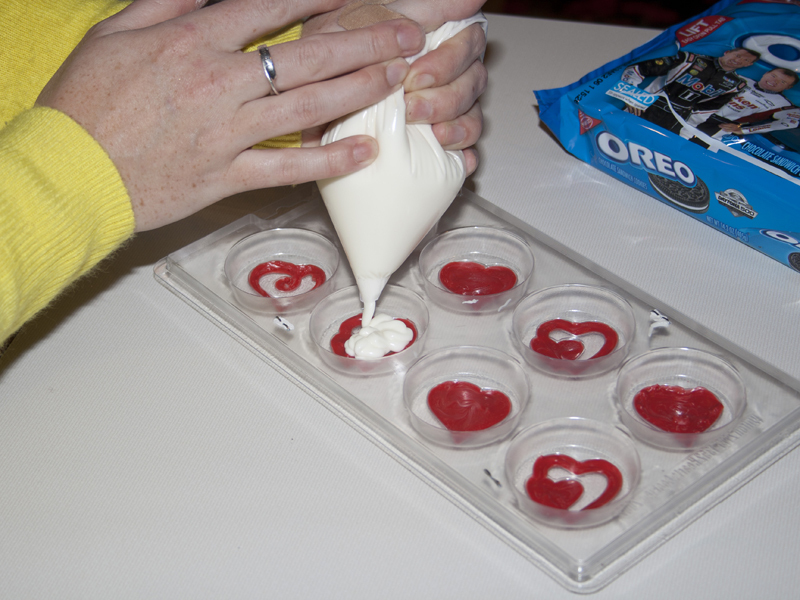 Bonus, Wilton makes these Oreo molds for various occasions, so you aren’t just limited to hearts! 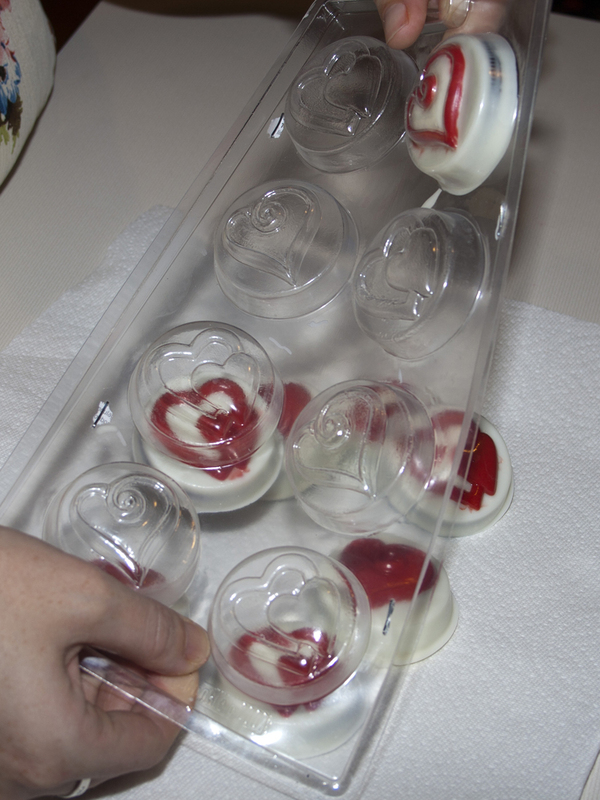 Brush colored candy details in the mold, let set, then add more melted candy and position your cookie in the mold. Allow to cool, then twist to remove. these are so cute! Your kids peers are going to love them!